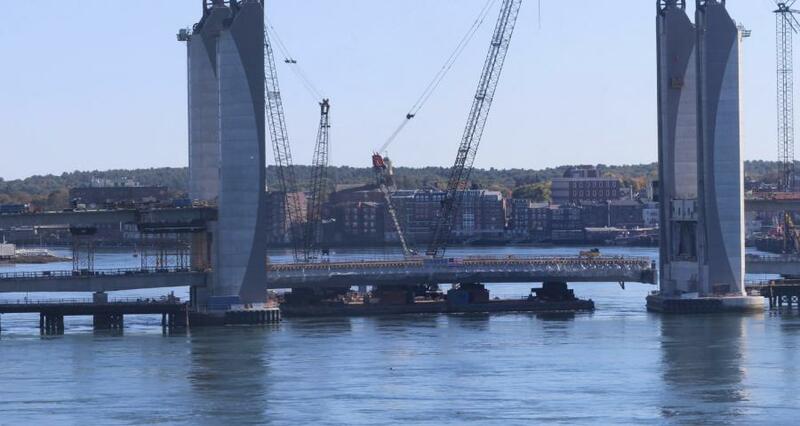 The float-in of the lift span for the new Sarah Mildred Long Bridge, which connects Kittery, Maine, and Portsmouth, N.H., across the Piscataqua River, took place the morning of Oct. 18. On Oct. 17, the navigational channel was closed to all vessels — from kayaks to tankers — within a 300-yd. radius of the bridge. The nearly 3-million lb. 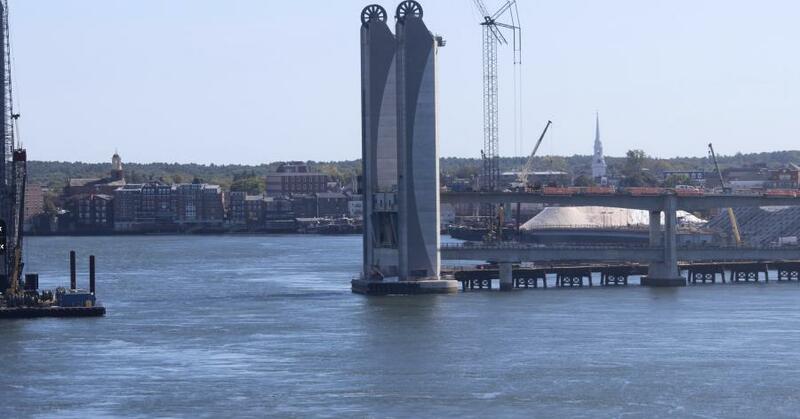 center lift span was floated in on barges across the Piscataqua River between 10 a.m. and noon and positioned for the float in. On Oct. 18, between 6 a.m. and 9 a.m. the rising tide lifted the span to clear the bearings. Between 9 a.m. and noon the lift span was put into position over the bearings. At 1:45 p.m. the outgoing tide lowered the lift span onto the bearings. Once resting on the bearings, the barge was pushed to the state pier. Adequate clearance to remove the barge from under the lift span occurred at approximately 3:45 p.m.
Once complete and placed in-service, the new lift span will weigh approximately 4 million lbs. or 2,000 tons. The new bridge alignment will improve marine navigation by increasing the navigational clearance allowing larger ships to access the port and shipyard. With a larger 56-ft. vertical clearance in its resting position, there will be 68 percent fewer bridge openings. Two hundred foot tall precast concrete towers will support the 300-ft. long streamlined structural steel box girder lift span. There are eight operating ropes (steel cables) that pull the counterweights up and down to lift and lower the bridge. If laid end to end these operating ropes would stretch more than a mile and the 40 counterweight ropes that support the four corners of the new lifts span would extend more than 2 mi. The SML replacement project is a joint venture between the Maine and New Hampshire Departments of Transportation, with MaineDOT serving as the lead. The design process began in 2013 and construction started in January of 2015. The new bridge was designed by a joint venture between specialty bridge design firms FIGG I Hardesty & Hanover. Maine-based Cianbro is the construction firm for the project. The new Sarah Mildred Long Bridge is expected to open to traffic in November. The project is expected to cost approximately $160 million and is scheduled to be completed by June 1, 2018.